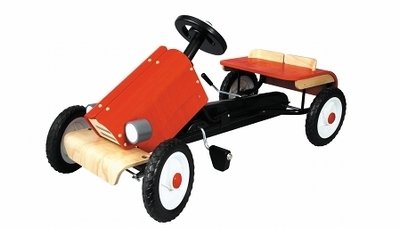 Plan Toys 3445 - The classic ride-on car has a durable metal chassis, a sturdy wooden body, rubber tires, steering wheel, and single passenger seat. The Racing Car comes equipped with non-slip pedals and safety brake. Measures 17.7" x 38.8" x 18.9". Made from rubber wood and non-toxic water-based dyes. Assembly required.